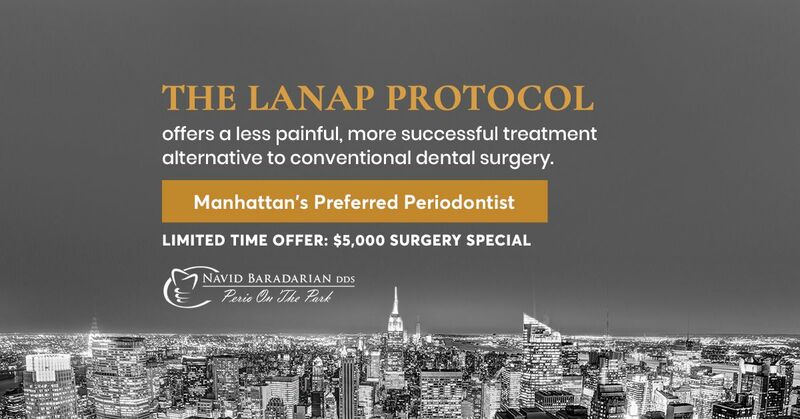 Dr. Navid Baradarian continuously remains at the apex of advanced periodontal techniques and procedures, which is why he is offering LANAP® laser periodontal surgery at our New York, NY, office. LANAP, which stands for laser-assisted new attachment procedure, is a surgical laser therapy for the treatment of periodontitis. It works by regenerating gum tissue rather than resectioning it. This gum disease treatment is less invasive than traditional gum grafting and produces lasting results. With careful treatment planning and placement, only four dental implants are needed to firmly hold a full denture in place. 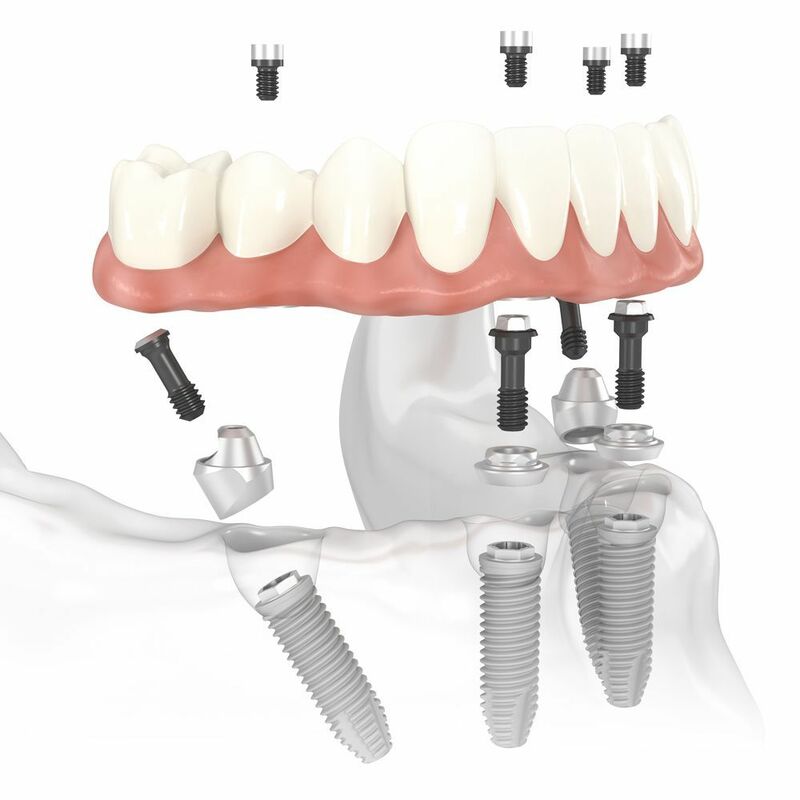 All-on-4 dental implants can provide an excellent solution for patients experiencing multiple tooth loss and looking to avoid additional surgical procedures, such as bone grafting. All-on-4 treatment provides a cost-effective and quick solution to restoring missing teeth, compared to conventional dental implants. Traditionally, full-arch implant-supported dentures are supported by six to eight dental implants and require sturdy jawbone density and/or a bone grafting procedure. But with All-on-4, bone grafting can typically be avoided by simply tilting the posterior implants during insertion, using available jawbone. This provides patients with jawbone degeneration the ability to qualify for an implant-supported denture. During the procedure, Dr. Baradarian will insert two straight implants in the front of the arch and two tilted implants up to 45º on either side of the anterior implants to create a solid foundation. In some cases, Dr. Baradarian can place the restoration on the same day the implants are inserted, to immediately restore dental function and aesthetics. To determine your candidacy for this procedure, Dr. Baradarian will perform a series of digital x-rays and scans to evaluate your bone structure. He will also review the costs involved and procedural steps with you, addressing any concerns you may have. All-on-4 implants generally cost about $8,000, which includes the consultation, scans, and surgery. Restoration design and placement is additional. LANAP is performed in just two appointments, whereas more traditional gum disease procedures, such as gum grafting, could take up to six. Each LANAP appointment takes about two hours. During the first appointment, the left side of the mouth will be treated, and about a week later, the right side of the mouth will be treated. Below are the basic steps to expect during your office visit. Anesthesia: Before beginning the procedure, Dr. Baradarian will numb the area with a local anesthetic. If necessary, he can also provide stronger sedation, such as nitrous oxide and oral conscious medication. 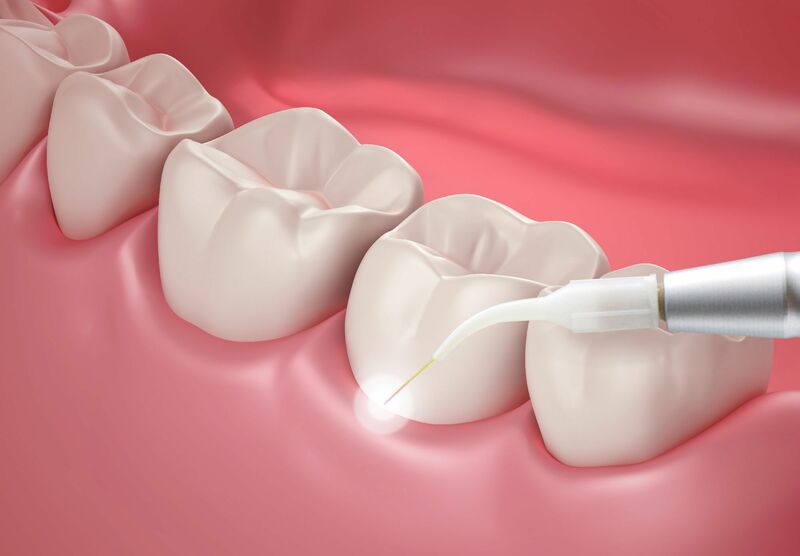 Tissue Removal: Once you are comfortable, he will insert the PerioLase dental laser into the affected periodontal pocket to remove diseased bacteria and unhealthy tissue. Cleaning: Once the unhealthy tissue has been removed, he will use an ultrasonic scaler and special dental instruments to clean the root surface of the tooth. Blood Clot: After each tooth has been thoroughly treated and cleaned, Dr. Baradarian will re-insert the laser into the pocket to create a gel clot containing periodontal ligament fibers to prevent bacteria from reentering the area. Bite Adjustment: If necessary, Dr. Baradarian may splint your tooth and make a simple bite adjustment to stabilize the blood clot, alleviate pressure, and protect the surgical site from irritation. Healing and Regeneration: Over the course of the next six to 12 months, Dr. Baradarian will monitor your healing as the hard and soft tissues regenerate.